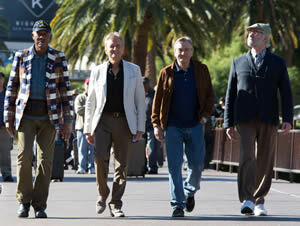 Last Vegas is an old and tired formulaic story about aging as seen through Hollywood’s rose-colored lenses. It’s always a shame when a colorful cast of A-listers is brought together to tell a ho-hum story. It happened to Robert De Niro a couple months ago with The Family and it’s happened again with Last Vegas, in which De Niro is joined by Michael Douglas (Romancing the Stone), Morgan Freeman (The Bucket List) and Kevin Kline (No Strings Attached). The setup is entertaining enough, albeit plausible by only the thinnest of margins. Billy (Douglas) is a successful businessman who’s still playing the game and living the dream. So much so, in fact, he’s scored a hot fiancé who’s not even half his age. While giving a eulogy at a friend’s funeral, it’s only natural he should mention his nubile, young fiancé. And, heck, while he’s got the stage – and her undivided attention – he might as well pop the question. Of course she accepts. After all, it’d be bad form to bring down the mood at a funeral by rejecting a marriage proposal. It’s an unfortunate forehead-smacking moment in the early going, but it serves as a cut-to-the-chase presentation of the realities of old age countered by the hope and aspirations of youth and life itself. Well, maybe that’s too much of a hoity-toity stretch; this movie’s ambitions really aren’t that lofty. While Billy’s life is going great guns, his friends from the glory days of the Flatbush Four haven’t fared as well and they’re living la vida boring. What better thing to do, then, than to throw a bachelor party in Vegas to celebrate Billy’s good fortunes? Paddy (De Niro) is a brooding curmudgeon who’s been unable to move on following the death of his wife. And he holds a severe grudge against Billy for skipping his wife’s funeral; she really wanted him to give her eulogy. And there’s more to that back story involving the nuances of love. What is love? Can somebody love on command and have it lead to a decades-long romance? Well, at the risk of being a spoiler, that line of reasoning is the dental floss that attempts to string the story along. Anyway, Archie (Freeman) has suffered from a stroke or two and his family wants him to live the rest of his days taking it extremely easy. He sneaks off to Vegas under the guise of a church group retreat. Sam (Kline) is stuck in retirement community hell and is eager for a break; his wife even offers him a condom and a single blue pill to help him out and, hopefully, have him return to her reinvigorated and ready for whoopie. How loving is that? After all, what happens in Vegas stays in Vegas — unless you come to the conclusion, at a most inopportune time, that openness and honesty with your partner of decades trumps that Vegas code. That’s a double-whammy of a forehead smack, making for a total of three open palms to the forehead so far. Last Vegas is in some respects the epitome of a typical trip to Vegas. It’s fun at the beginning of the trip, but by the time all the money’s gone, all the artificiality of the place wears out its welcome. In this case, as the Medicare Pack ventures out to the casinos in an effort to have a good time — despite Paddy’s permanent scowl — there are a few chuckles to be had. 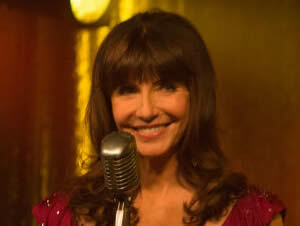 And it’s nice to see Mary Steenburgen (Time After Time) as Diana, an older siren who catches the eye of both Billy and Paddy. For them, it’s déjà vu all over again, to use the ol’ Yogi Berra expression. She’s a lounge singer who’s used to belting out the standards in front of a room full of empty tables, but she also serves as the catalyst to bring an understanding of friendship and love between Billy and Paddy. But the story gets long in the tooth — hence the earlier reference to dental floss, wink wink. There’s a whole lot of beating around the bush as Billy and Paddy and Diana try mightily to pull at the heart strings and steer the plodding storyline to an all-smiles conclusion that includes an incredibly implausible bachelor party with Cirque du Soleil performers, cross-dressers and lots of lithe young bodies in attendance. Whoa. There’s a whole bunch of forehead smacks in there. Too many to count. Back in their heyday decades ago, the Flatbush Four stole a bottle of scotch as payback for all the bullying they endured. That bottle, now some 58 years old, is pulled out for celebrating while the gang savors Vegas. They should share it with the audience; certainly some kind of medication is needed for the headache that follows all those palms to the head. On second thought, maybe that’s not such a good idea.